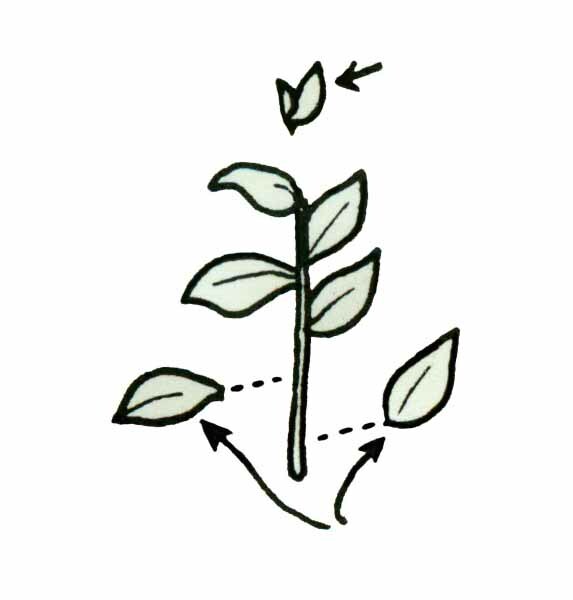 Select new growth that is starting to hardening off. 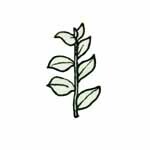 Carefully remove lower leaves. Pinch out any soft tips and flower buds. Dip end of cutting in a rooting hormone like Dip 'N Grow. 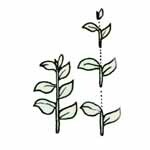 Note: Long cuttings may be cut in shorter sections if many plants are desired. 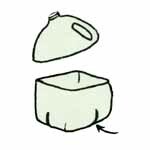 Use a cut-off plastic jug or any clean pot. Make slits in the bottom for later drainage. Medium: 1/3 Peat, 1/3 sand, & 1/3 perlite Fill about 2 to 3 inches deep. Soil should be damp but not too wet. Insert cuttings, but not too deep. Spray for bugs if needed. Enclose in a clear plastic bag. Grow under fluorescent lights, 16 to 24 hours a day. No need to water or fertilize. Make short cuttings, 2 to 3 inches long. 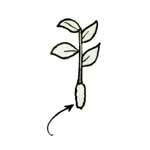 Pinch out the soft growing tip to stop flower bud formation. 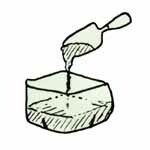 Remove excess foliage at the base. Long cuttings can often be cut into several sections if desired. Optional: To combat insects or disease, submerge cuttings in a 10% Clorox solution for 5 minutes and then rinse very well. You can also spray with an insecticide / fungicide mix after the cuttings are stuck. Dip the end of each cutting in a rooting hormone such as Dip 'N Grow or Rootone. Shake off excess. Insert the bottom inch of the cutting into a container filled with a porous medium ( 1/2 Peat, 1/4 Sand, 1/4 Perlite). The medium should be damp but not wet since too much moisture encourages rotting. 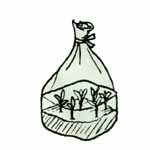 Enclose containers in clear plastic bags and place under fluorescent lights with "long day" conditions (16 to 24 hours of light each day). A bright north window out of direct sun can be used in lieu of lights. Cuttings should root in 2 to 4 months. They usually require no water and are best kept on the "dry side" since most problems are caused by excess moisture. 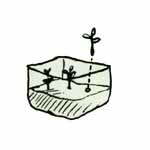 After well rooted, gradually remove plastic bags and continue growing under lights the first winter or else provide cold frame protection. Avoid fertilizer under low light conditions as it encourages disease. Don't fertilize cuttings that will winter outside for they must go dormant before frost. Keep deciduous azaleas growing under lights until the new growth starts. Otherwise they often will never break dormancy and die the next year.